A motor neuron (or motoneuron) is a neuron whose cell body is located in the motor cortex, brainstem or the spinal cord, and whose axon (fiber) projects to the spinal cord or outside of the spinal cord to directly or indirectly control effector organs, mainly muscles and glands. There are two types of motor neuron – upper motor neurons and lower motor neurons. Axons from upper motor neurons synapse onto interneurons in the spinal cord and occasionally directly onto lower motor neurons. The axons from the lower motor neurons are efferent nerve fibers that carry signals from the spinal cord to the effectors. Types of lower motor neurons are alpha motor neurons, beta motor neurons, and gamma motor neurons. 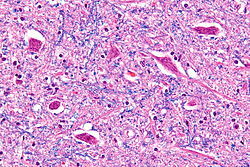 Micrograph of the hypoglossal nucleus showing motor neurons with their characteristic coarse Nissl substance ("tigroid" cytoplasm). H&E-LFB stain. A single motor neuron may innervate many muscle fibres and a muscle fibre can undergo many action potentials in the time taken for a single muscle twitch. As a result, if an action potential arrives before a twitch has completed, the twitches can superimpose on one another, either through summation or a tetanic contraction. In summation, the muscle is stimulated repetitively such that additional action potentials coming from the somatic nervous system arrive before the end of the twitch. The twitches thus superimpose on one another, leading to a force greater than that of a single twitch. A tetanic contraction is caused by constant, very high frequency stimulation - the action potentials come at such a rapid rate that individual twitches are indistinguishable, and tension rises smoothly eventually reaching a plateau. Motor neurons begin to develop early in embryonic development, and motor function continues to develop well into childhood. In the neural tube cells are specified to either the rostral-caudal axis or ventral-dorsal axis. The axons of motor neurons begin to appear in the fourth week of development from the ventral region of the ventral-dorsal axis (the basal plate). This homeodomain is known as the motor neural progenitor domain (pMN). Transcription factors here include Pax6, OLIG2, Nkx-6.1, and Nkx-6.2, which are regulated by sonic hedgehog (Shh). The OLIG2 gene being the most important due to its role in promoting Ngn2 expression, a gene that causes cell cycle exiting as well as promoting further transcription factors associated with motor neuron development. Further specification of motor neurons occurs when retinoic acid, fibroblast growth factor, Wnts, and TGFb, are integrated into the various Hox transcription factors. There are 13 Hox transcription factors and along with the signals, determine whether a motor neuron will be more rostral or caudal in character. In the spinal column, Hox 4-11 sort motor neurons to one of the five motor columns. 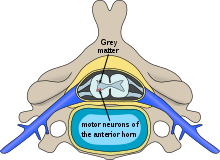 Upper motor neurons originate in the motor cortex located in the precentral gyrus. The cells that make up the primary motor cortex are Betz cells, which are a type of pyramidal cell. The axons of these cells descend from the cortex to form the corticospinal tract. Corticomotorneurons are neurons in the primary cortex which project directly to motor neurons in the ventral horn of the spinal cord. Axons of corticomotorneurons terminate on the spinal motor neurons of multiple muscles as well as on spinal interneurons. They are unique to primates and it has been suggested that their function is the adaptive control of the distal extremities (e.g. the hands) including the relatively independent control of individual fingers. Corticomotorneurons have so far only been found in the primary motor cortex and not in secondary motor areas. Lower motor neurons are those that originate in the spinal cord and directly or indirectly innervate effector targets. The target of these neurons varies, but in the somatic nervous system the target will be some sort of muscle fiber. There are three primary categories lower motor neurons, which can be further divided in sub-categories. Somatic motor neurons originate in the central nervous system, project their axons to skeletal muscles  (such as the muscles of the limbs, abdominal, and intercostal muscles), which are involved in locomotion. The three types of these neurons are the alpha efferent neurons, beta efferent neurons, and gamma efferent neurons. They are called efferent to indicate the flow of information from the central nervous system (CNS) to the periphery. Slow (S) motor units stimulate small muscle fibers, which contract very slowly and provide small amounts of energy but are very resistant to fatigue, so they are used to sustain muscular contraction, such as keeping the body upright. They gain their energy via oxidative means and hence require oxygen. They are also called red fibers. Fast fatiguing (FF) motor units stimulate larger muscle groups, which apply large amounts of force but fatigue very quickly. They are used for tasks that require large brief bursts on energy, such as jumping or running. They gain their energy via glycolytic means and hence don't require oxygen. They are called white fibers. Fast fatigue-resistant motor units stimulate moderate-sized muscles groups that don't react as fast as the FF motor units, but can be sustained much longer (as implied by the name) and provide more force than S motor units. These use both oxidative and glycolytic means to gain energy. In addition to voluntary skeletal muscle contraction, alpha motor neurons also contribute to muscle tone, the continuous force generated by noncontracting muscle to oppose stretching. When a muscle is stretched, sensory neurons within the muscle spindle detect the degree of stretch and send a signal to the CNS. The CNS activates alpha motor neurons in the spinal cord, which cause extrafusal muscle fibers to contract and thereby resist further stretching. This process is also called the stretch reflex. Beta motor neurons innervate intrafusal muscle fibers of muscle spindles, with collaterals to extrafusal fibres. There are two types of beta motor neurons: Slow Contracting- These innervate extrafusal fibers. Fast Contracting- These innervate intrafusal fibers. Gamma motor neurons innervate intrafusal muscle fibers found within the muscle spindle. They regulate the sensitivity of the spindle to muscle stretching. With activation of gamma neurons, intrafusal muscle fibers contract so that only a small stretch is required to activate spindle sensory neurons and the stretch reflex. There are two types of gamma motor neurons: Dynamic- These focus on Bag1 fibers and enhance dynamic sensitivity. Static- These focus on Bag2 fibers and enhance stretch sensitivity. Size Principle – this relates to the soma of the motor neuron. This restricts larger neurons to receive a larger excitatory signal in order to stimulate the muscle fibers it innervates. By reducing unnecessary muscle fiber recruitment, the body is able to optimize energy consumption. Persistent Inward Current (PIC) – recent animal study research has shown that constant flow of ions such as calcium and sodium through channels in the soma and dendrites influence the synaptic input. An alternate way to think of this is that the post-synaptic neuron is being primed before receiving an impulse. After Hyper-polarization (AHP) – we are all familiar with the idea of hyperpolarization after an action potential. A trend has been identified that shows slow motor neurons to have more intense AHPs for a longer duration. One way to remember this is that slow muscle fibers can contract for longer, so it makes sense that their corresponding motor neurons fire at a slower rate. The interface between a motor neuron and muscle fiber is a specialized synapse called the neuromuscular junction. Upon adequate stimulation, the motor neuron releases a flood of acetylcholine (Ach) neurotransmitters from the axon terminals from synaptic vesicles bind with the plasma membrane. The acetylcholine molecules bind to postsynaptic receptors found within the motor end plate. Once two acetylcholine receptors have been bound, an ion channel is opened and sodium ions are allowed to flow into the cell. The influx of sodium into the cell causes depolarization and triggers a muscle action potential. T tubules of the sarcolemma are then stimulated to elicit calcium ion release from the sarcoplasmic reticulum. It is this chemical release that causes the target muscle fiber to contract. In invertebrates, depending on the neurotransmitter released and the type of receptor it binds, the response in the muscle fiber could be either excitatory or inhibitory. For vertebrates, however, the response of a muscle fiber to a neurotransmitter can only be excitatory, in other words, contractile. Muscle relaxation and inhibition of muscle contraction in vertebrates is obtained only by inhibition of the motor neuron itself. This is how muscle relaxants work by acting on the motor neurons that innervate muscles (by decreasing their electrophysiological activity) or on cholinergic neuromuscular junctions, rather than on the muscles themselves. These are also known as branchial motor neurons, which are involved in facial expression, mastication, phonation, and swallowing. Associated cranial nerves are the oculomotor, abducens, trochlear, and hypoglossal nerves. These motor neurons indirectly innervate cardiac muscle and smooth muscles of the viscera ( the muscles of the arteries): they synapse onto neurons located in ganglia of the autonomic nervous system (sympathetic and parasympathetic), located in the peripheral nervous system (PNS), which themselves directly innervate visceral muscles (and also some gland cells). In consequence, the motor command of skeletal and branchial muscles is monosynaptic involving only one motor neuron, either somatic or branchial, which synapses onto the muscle. Comparatively, the command of visceral muscles is disynaptic involving two neurons: the general visceral motor neuron, located in the CNS, synapses onto a ganglionic neuron, located in the PNS, which synapses onto the muscle. ^ Tortora, Gerard; Derrickson, Bryan (2014). Principles of Anatomy & Physiology (14th ed.). New Jersey: John Wiley & Sons, Inc. pp. 406, 502, 541. ISBN 978-1-118-34500-9. ^ Pocock, Gillian; Richards, Christopher D. (2006). Human physiology : the basis of medicine (3rd ed.). Oxford: Oxford University Press. pp. 151–153. ISBN 978-0-19-856878-0. ^ Russell, Peter (2013). Biology - Exploring the Diversity of Life. Toronto: Nelson Education. p. 946. ISBN 978-0-17-665133-6. ^ Tortora, Gerard; Derrickson, Bryan (2011). Principles of Anatomy Physiology (14th ed.). New Jersey: John Wiley & Sons, Inc. pp. 1090–1099. ISBN 978-1-118-34500-9. ^ Sadler, T. (2010). Langman's medical embryology (11th ed.). Philadelphia: Lippincott William & Wilkins. pp. 299–301. ISBN 978-0-7817-9069-7. ^ a b Davis-Dusenbery, BN; Williams, LA; Klim, JR; Eggan, K (February 2014). "How to make spinal motor neurons". Development. 141 (3): 491–501. doi:10.1242/dev.097410. PMID 24449832. ^ Edgar R, Mazor Y, Rinon A, Blumenthal J, Golan Y, Buzhor E, Livnat I, Ben-Ari S, Lieder I, Shitrit A, Gilboa Y, Ben-Yehudah A, Edri O, Shraga N, Bogoch Y, Leshansky L, Aharoni S, West MD, Warshawsky D, Shtrichman R (2013). "LifeMap Discovery™: The Embryonic Development, Stem Cells, and Regenerative Medicine Research Portal". PLoS ONE. 8 (7): e66629. doi:10.1371/journal.pone.0066629. ISSN 1932-6203. PMC 3714290. ^ Philippidou, Polyxeni; Walsh, Carolyn; Aubin, Josée; Jeannotte, Lucie; Dasen, Jeremy S. "Sustained Hox5 Gene Activity is Required for Respiratory Motor Neuron Development". Nature Neuroscience. 15 (12): 1636–1644. doi:10.1038/nn.3242. ISSN 1097-6256. PMC 3676175. PMID 23103965. ^ a b c d Lemon, Roger N. (April 4, 2008). "Descending Pathways in Motor Control". Annual Review of Neuroscience. 31 (1): 195–218. doi:10.1146/annurev.neuro.31.060407.125547. ISSN 0147-006X. ^ Tortora, G. J., Derrickson, B. (2011). The Spinal Cord and Spinal Nerves. In B. Roesch, L. Elfers, K. Trost, et al. (Ed. ), Principles of Anatomy and Physiology (pp. 443-468). New Jersey: John Wiley & Sons, Inc.
^ a b "CHAPTER NINE". www.unc.edu. Archived from the original on 2017-11-05. Retrieved 2017-12-08. ^ Silverthorn, Dee Unglaub (2010). Human Physiology: An Integrated Approach. Pearson. p. 398. ISBN 978-0-321-55980-7. ^ a b Tortora, G. J., Derrickson, B. (2011). Muscular Tissue. In B. Roesch, L. Elfers, K. Trost, et al. (Ed. ), Principles of Anatomy and Physiology (pp. 305-307, 311). New Jersey: John Wiley & Sons, Inc.
^ a b c d e Manuel, Marin; Zytnicki, Daniel (2011). "Alpha, Beta, and Gamma Motoneurons: Functional Diversity in the Motor System's Final Pathway". Journal of Integrative Neuroscience. 10 (03): 243–276. doi:10.1142/S0219635211002786. ISSN 0219-6352. Sherwood, L. (2001). Human Physiology: From Cells to Systems (4th ed.). Pacific Grove, CA: Brooks-Cole. ISBN 0-534-37254-6. Marieb, E. N.; Mallatt, J. (1997). Human Anatomy (2nd ed.). Menlo Park, CA: Benjamin/Cummings. ISBN 0-8053-4068-8.